All Eyez on Me is a streamline biopic in that it uses conventional flashbacks to lay out the story of Tupac’s life. Beginning with the struggles of his parents - both black activists in the 1970s - he overcame unbelievable odds to not just survive, but to accomplish what he accomplished. Director Benny Boom (Next Day Air, 2012) knew exactly what he wanted in this film, and he brought it to life with a stunning lead performance on the part of Demetrius Shipp Jr. who resembles the real-life Tupac in a way that is quite honestly hard to take in. The script never puts on the kid gloves when it deals with life in the ghetto. But the film is a frustrating film. It spends a little too long trying to set the stage and tries to take on way too much at times to show us the active players in Tupac's life, but it shows us how he changed, along with all of those he influenced. The pacing isn’t always even, but fans will appreciate the extra efforts made to showcase Tupac's on-stage performances. Even those who don’t and didn’t follow him should bid a nod of respect for Tupac’s talent, in particular his poetic gift, his sense of loyalty to those he considered family, not to mention his onstage ability to put a crowd in aw. His mind not being undersold, we smirk in disbelief every single time he instigates or else refuses to walk away from gratuitous violence or else succumbs to the typical shortsighted allure of power, profit, and fame. The film uses the cherished technique of a reporter interviewing a subject, which makes easy opportunities for flashbacks. Hill Harper, the journalist, is the one conducting the interview with Tupac in 1995 from prison. The reporter asks about Tupac’s upbringing, and we’re taken right back to his childhood in East Harlem and then in Baltimore where life spun out of control over and over again, as his mother had to keep moving him around. Tupac’s mother, “Afeni Shakur” (Danai Gurira) gives a spot-on performance with "Mutulu Shakur" (Jamie Hector) doing almost as well. The two were active members of the Black Panther Party. At the Baltimore School of Arts, a young and idealistic Tupac meets and bonds with “Jada Pinkett” (Kat Graham), who is, in a very real sense, the conscience behind Tupac for the rest of his life. The two share a kindred sensitivity that we see Tupac grow away from as his hardening fame takes its toll. But we respect this because it distinguishes younger from older Tupac and thus highlights for us just how life changes us. This is one of the biggest strengths of the film. When Tupac signs with Digital Underground, he steps up a notch, and goes to bestselling performer in a super-short amount of time. From there, his own revolutionary status surpassed that of his parents. His mother was definitely proud, and probably also his father who remains behind bars to this day. But his increasing status made him a lighting rod for hostility. Tupac’s character comes out time and again in the film, as he is seen as a winner-take-all artist, and at the same time, a poet who speaks untold horrors about the life many refuse to see in inner-city neighborhoods, such as a 13-year-old girl having a baby on the floor of her bathroom. The record labels didn't want him to include it, but he wouldn't relent. And that's what made him the sensation he became. He kept things real. 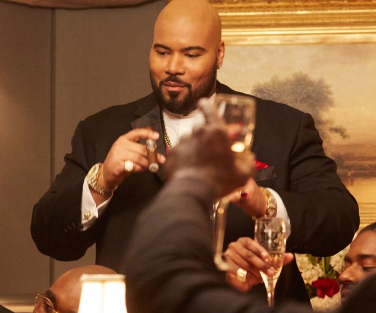 Dominic L. Santana as the ruthless Suge Knight of Death Row Records. But, as stated before, time changes us all, and we watch as Tupac signs his career over to the manipulative, self-seeking, hostile, and king-pinnish “Suge Knight” (Dominic L. Santana) of Death Row Records. Santana’s is another stout performance in the film, and one that represents Suge’s character almost to a “t”. Blistering feuds start up between “Notorious B.I.G.” (Jamal Woolard) and “Snoop Dogg” (Jarrett Ellis), but they all relish in the indulgences of super-stardom at their own expense. They are not much different from each other when all is said and done. 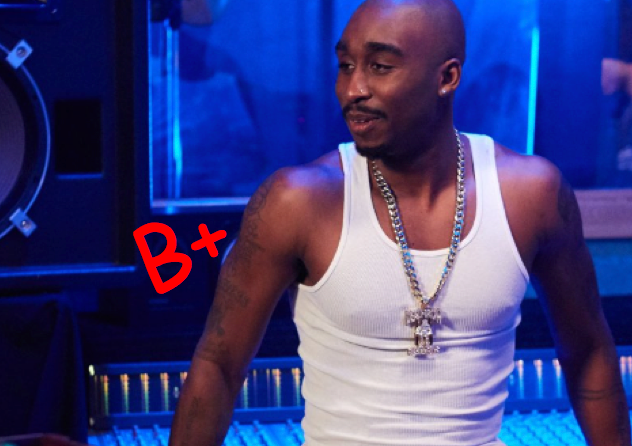 As stated, Demetrius Shipp Jr. bears such a crazy resemblance to Tupac that it is just stupifying, but his performance runs significantly deeper than at first meets the eye. Shipp does a fine job capturing Tupac’s energy and stage presence, as well as his temper and tendency to stir up trouble needlessly. Two decades after Tupac’s death (he was shot on the street in 1996), his murder remains unsolved. But his music - and influence - lives on. There is something appealing about a flawed hero, even if that hero happens not to be yours.